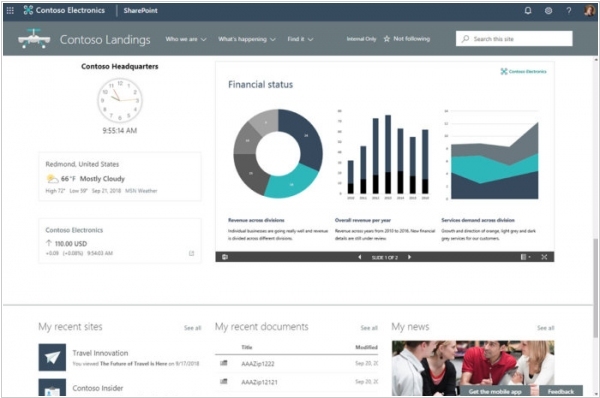 Microsoft announced some new improvements for SharePoint and Office 365 sites. One of the key features is the ability to designate one communication site as the official news portal for the organization. News posted to the official news portal gets a special indicator so that it is easy to tell — both on mobile and on SharePoint home — which news posts are coming from the official news portal. Another new feature - is the ability to target content to different audiences based on AD Group membership, including dynamic groups. Also SharePoint sites are getting the ability to create mega-menus for navigation. Perhaps for many people it will be a surprise, but Microsoft Office 365 allows to create a public website for your company (thanks to SharePoint Online component). The practice of building websites on SharePoint existed for a long time. But it was quite expensive (due to the cost of SharePoint licenses and Windows hosting). Second, SharePoint was originally designed for intranet portals, and for public sites it's not very appropriate. Therefore, only large companies (for whatever reasons) used SharePoint as a website engine. But with the appearance of Office 365 things changed to better. Having Office 365 subscription, small business owner can create a company website for free. And the only technical skills he needs - is Word editing. Russian intranet portal maker 1C-Bitrix is taking on Chatter, Yammer, Socialcast and other social intranet services with its latest product Bitrix24. And this service is not just yet another "Facebook for Enterprise" clone. It's created in the unique style of 1C-Bitrix. In fact Bitrix24 looks like "Facebook for Enterprise" only at first glance - on the home page there is an activity stream where you can post messages and comments and see the latest actions in the system. But under the hood of this home page you will find the common (for 1C-Bitrix) set of million functions: tasks, file storage (with version control), calendar, photo galleries, instant messager, extranet, CRM, workflow builder, time tracker, profiles, reports, mobile version ... Of course, it's cool on the one hand. But on the other - too heavy for SaaS. And during the first real stress test (on the release day) the service experienced big problems with scalability. Of course, it's not a big issue in our time. 1C-Bitrix will spend some more money for backend and ensure the reliable performance of the service. Besides users will always have the "Plan B" - you can always transfer your data from Bitrix24 to locally-installed 1C-Bitrix Intranet. However, you'll need to purchase the licenses for a local version first. Bitrix24 provides a free version with a wide functionality for 12 users and 5GB of cloud storage. The paid version for unlimited users, 50GB and with extranet module costs $99/month. And the full version (100 GB) costs $199/month. Jive Software and other Enterprise 2.0 software vendors should start to worry. Acquia - the company that rules the Drupal project - has released the free open-source solution for creating social intranet and extranet portals Drupal Commons. Of course, before now many companies also were using Drupal CMS to power internal and external portals. If you look at any Enterprise 2.0 systems rating, you will find Drupal among leaders fo the industry. But Drupal customization - is not so easy. 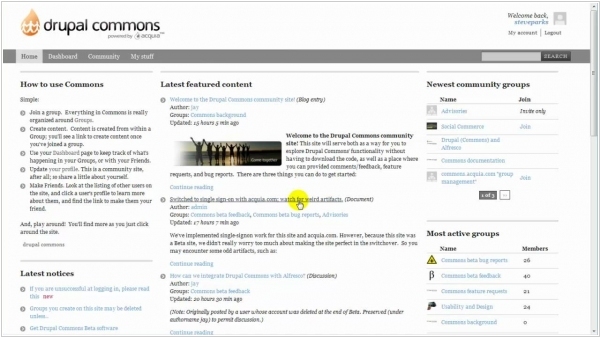 And Drupal Commons - is an out-of-box solution for enterprise social networks. It provides profiles, dashboards and groups. Each group has a blog, forum, chat, wiki, document storage with version control, polls, calendar, RSS (from external sites). Each group administrator controls the entry rules and the access rights for the group participants. The community-manager is provided with the analytical panel where he can see how active are the users involved in the community, what content is most popular, etc. Besides, very important for enterprise users - is that the solution provides modules for integration with LDAP-directory and CRM system. And if a company wants to customize something, then it just needs to find someone who is familiar with Drupal, because Drupal Commons uses the standard Drupal API and supports common modules created for Drupal CMS. Acquia also provides hosting services for Drupal Commons, as well as customization and professional support (of course for a fee).